CCs (continuous controllers) are how you control the dynamics in LASS’s legato and sustained patches. Great dynamic control is a key component to a great sounding string library and many users have their own preferences regarding dynamics and how they interact with their hardware. Although LASS provides you with thoroughly tested and responsive default CC curves, with the ARC’s CC Tables page it is easier than ever to create your own across multiple patches at the same time. 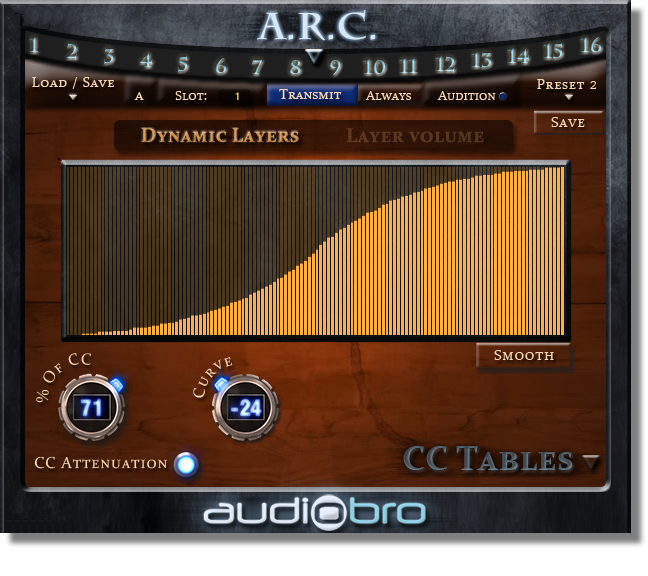 The CC Attenuation knob allows you to lower the dynamic range of your performance by any percentage you want. You might play a string part and like everything about it except you may wish it was a little softer overall… but you may still want to maintain the relative dynamics you performed with just the turn of a knob. The CC Attenuator is also a great feature for adding variety between string parts without having to re-perform them.